We love to try new restaurants and places to eat, and it’s always fun to find a place that has a really great atmosphere. Sometimes atmosphere can be found inside, and other times it can be found outside, with a really great view – and in this article, I’m highlighting great views from the TOP! Who doesn’t like pizza? Bazbeaux knows pizza – really great pizza – and if you are visiting the Broad Ripple location on a nice day in the summer you may get to sit on their rooftop dining room. Take in the view of the canal, or just people watch from above. Also located in Broad Ripple is 10-01, which offers family-friendly dining, and a balcony view of the bustling main drag, Broad Ripple Avenue. One of my favorite places to eat, that just happens to have a great view, is Rick’s Café Boatyard. Located overlooking Eagle Creek Reservoir, Rick’s has good food, often a lively band, and views for days. Come over for dinner, or try lunch or Sunday brunch then head over to Eagle Creek Park for a boat ride at the marina, hike, or visit to the ornithology center! If water views are what you enjoy, you could also head north to Bella Vita on Geist Reservoir – and if you go on a Monday or Tuesday, kids eat free! A classic restaurant for in the sky dining is the Eagle’s Nest in downtown Indianapolis. 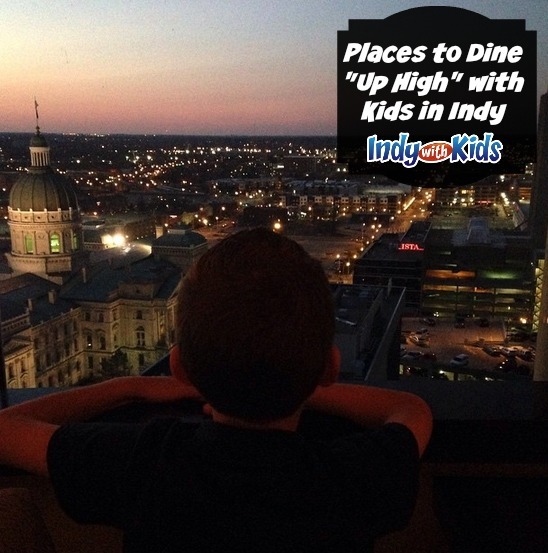 This upscale restaurant may not seem like a great spot for kids, but grab a bite to eat at one of the many downtown eateries then head to the Hyatt Regency for an impressive elevator ride to the top of the building for dessert. Reservations are recommended and ask for a table next to the windows for the best views of the city! Are you north of the city? Check out Ciao (formerly Il Villaggio) in Zionsville for upstairs outdoor dining in the back of the restaurant. After dinner take a walk back in time down the cute downtown Zionsville streets and peruse some of the local shops. Ok, this one may be a stretch, but I’m always impressed with the view from Victory Field. Grab an upper terrace box seat, and go on a Sunday, and not only do you get great up high seating – but kids eat free! A short walk from Victory Field is Tavern on South that boasts great outdoor balcony views and a lunch menu filled with sandwiches and crispy tavern pizzas. This summer it’s time to take dining to another level and head UP! No matter the side of town you live on there’s a spot near you with great “in the clouds” views! Did I miss your favorite? Let me know!